As the eldest son of an aristocratic family, Aloysius Gonzaga was in line to inherit his father’s title and lands. The violence and frivolity of Renaissance Italy shocked young Aloysius, and at an early age he began to adopt an ascetic lifestyle and dream of entering a religious order. Over the objections of his family, he became a member of the Society of Jesus at the age of 17, thereby renouncing his inheritance. While in the novitiate, the Jesuits ordered Aloysius to curb his ascetic practices and encouraged him to interact more with the other novices. Though suffering from chronic illness himself, during an outbreak of the plague in 1591 Aloysius volunteered to work in the Jesuit’s hospital in Rome. As a result, he died a few months after his 23rd birthday. Even at such a young age Aloysius had a reputation for holiness and was considered by many to be a saint. Artists often depict him holding the man from whom he contracted the fatal disease. Long considered the patron of plague victims, in recent years he has also become a patron for both AIDS patients and their caregivers. 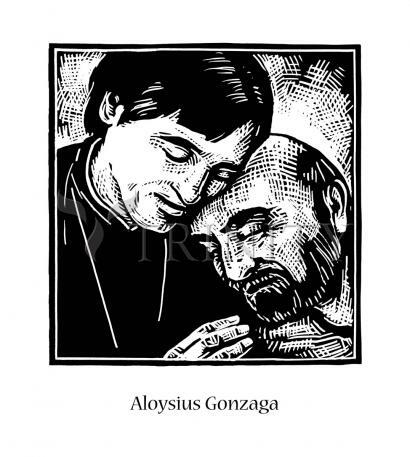 Aloysius Gonzaga is the patron saint of Christian youth as well. His feast day is June 21. The Lord can make saints anywhere, even amid the brutality and license of Renaissance life. Florence was the “mother of piety” for Aloysius Gonzaga despite his exposure to a “society of fraud, dagger, poison and lust.” As a son of a princely family, he grew up in royal courts and army camps. His father wanted Aloysius to be a military hero. At age seven he experienced a profound spiritual quickening. His prayers included the Office of Mary, the psalms and other devotions. At age nine he came from his hometown of Castiglione to Florence to be educated; by age 11 he was teaching catechism to poor children, fasting three days a week and practicing great austerities. When he was 13 years old he traveled with his parents and the Empress of Austria to Spain and acted as a page in the court of Philip II. The more Aloysius saw of court life, the more disillusioned he became, seeking relief in learning about the lives of saints. A book about the experience of Jesuit missionaries in India suggested to him the idea of entering the Society of Jesus, and in Spain his decision became final. Now began a four-year contest with his father. Eminent churchmen and laypeople were pressed into service to persuade him to remain in his “normal” vocation. Finally he prevailed, was allowed to renounce his right to succession and was received into the Jesuit novitiate. Like other seminarians, Aloysius was faced with a new kind of penance—that of accepting different ideas about the exact nature of penance. He was obliged to eat more, to take recreation with the other students. He was forbidden to pray except at stated times. He spent four years in the study of philosophy and had St. Robert Bellarmine (September 17) as his spiritual adviser. In 1591, a plague struck Rome. The Jesuits opened a hospital of their own. The general himself and many other Jesuits rendered personal service. Because he nursed patients, washing them and making their beds, Aloysius caught the disease himself. A fever persisted after his recovery and he was so weak he could scarcely rise from bed. Yet, he maintained his great discipline of prayer, knowing that he would die within the octave of Corpus Christi, three months later, at the age of 23. There is no more evident sign that anyone is a saint and of the number of the elect, than to see him leading a good life and at the same time a prey to desolation, suffering, and trials. May the comfort and grace of the Holy Spirit be yours forever, most honored lady. Your letter found me lingering still in this region of the dead, but now I must rouse myself to make my way on to heaven at last, and to praise God for ever in the land of the living; indeed I had hoped that before this time my journey there would have been over. If charity, as Saint Paul says, means “to weep with those who weep and rejoice with those who are glad,” then, dearest mother, you shall rejoice exceedingly that God in his grace and his love for you is showing me the path to true happiness, and assuring me that I shall never lose him. Take care above all things, most honored lady, not to insult God’s boundless loving kindness; you would certainly do this if you mourned as dead one living face to face with God, one whose prayers can bring you in your troubles more powerful aid than they ever could on earth. And our parting will not be for long; we shall see each other again in heaven; we shall be united with our Savior; there we shall praise him with heart and soul, sing of his mercies forever, and enjoy eternal happiness.